This is my entry to the Office Holiday Decoration contest. 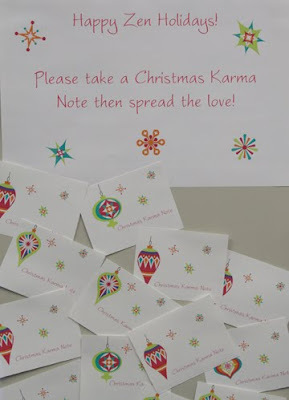 Christmas Karma Notes! They're little notes with positive, uplifting words for my co-workers. Then, if they want, they can share, thereby spreading the good karma. There are different phrases, so I don't know who is getting what ... that's up to the universe.